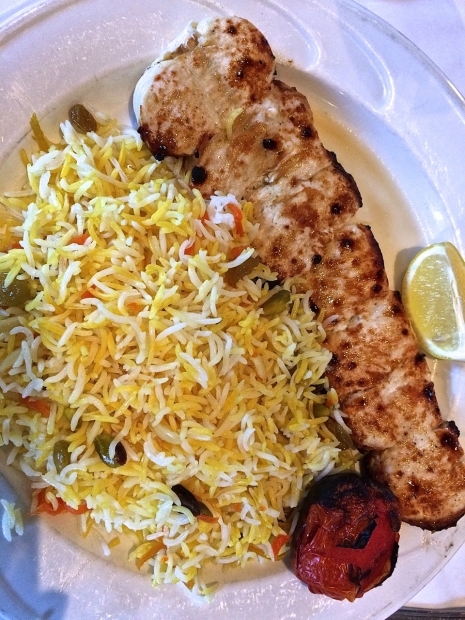 We consider Alborz the best Persian restaurant and one of the best bargains in San Francisco. That’s hard to beat. Add quietude (see below), and it’s almost impossible to beat. Alborz serves succulent beef, lamb, chicken and vegetarian dishes and the most delicious rice in town. It’s called Shirin Polo—Basmati rice with almonds, pistachio, raisin, orange peel and saffron. Even if it doesn’t come with your order, ask for it as a special order. Trust us, you shouldn’t leave town without tasting it. Alborz has white tablecloths, friendly servers, and astonishingly low prices. Examples: Combo Plate, an appetizer big enough to whet the tastebuds of a table of six, costs $15.95. A generous Mediterranean Salad? $8.95. Lamb shank in delicious broth with basmati rice, $18.95. That’s also the price of Fesenjoon, roasted walnuts in pomegranate sauce served with chicken. And oh, yes, Alborz is blessedly quiet, a rarity in San Francisco. You can actually have a conversation without yelling. That’s a treat in itself. It never ceases to amaze us how a restaurant reviewer can give a restaurant three stars and give it a bomb for noise level. That’s like dining in the middle of a Taylor Swift concert. What happened to romantic dining by candlelight? We like to go to a movie at 1000 Van Ness and then to Alborz just up the street. It’s a winning combo.